The medication commonly known as the "combination pill" contains synthetic versions of the female hormones estrogen and progesterone. The synthetic version of progesterone is called progestin. The "mini pill" only contains progestin. Both are effective forms of birth control and have other "off label" medical uses. Generally speaking, the progestin-only pill, often called the mini pill or POP, pill is prescribed for women who don't tolerate the combination pill well or who have certain health issues that require them to take in less estrogen. Neither pill protects you from sexually transmitted infections, including HIV. The combination pill is an oral contraceptive containing estrogen and progestin. The pill prevents pregnancy by stopping the ovulation process, which involves the releasing of an egg from your ovaries. The hormones "trick" your body into thinking you're pregnant. The pill also changes the mucus around your cervix, which makes it more difficult for sperm to enter your uterus. In addition, the pill changes the endometrium, or lining of your uterus, which makes it less conducive to an embryo. Most combination pills come in a 21-day or 28-day package. The first 21 pills of both types contain the hormone. The last seven pills in the 28-day package are placebo pills that help keep you in the habit of taking pills. Most women have their periods in the seven days they are not taking the hormone-containing pills. Another combination package can decrease your periods by having you take hormone-containing pills for 12 weeks and inactive pills for 7 days. This type reduces your periods to one every three months. 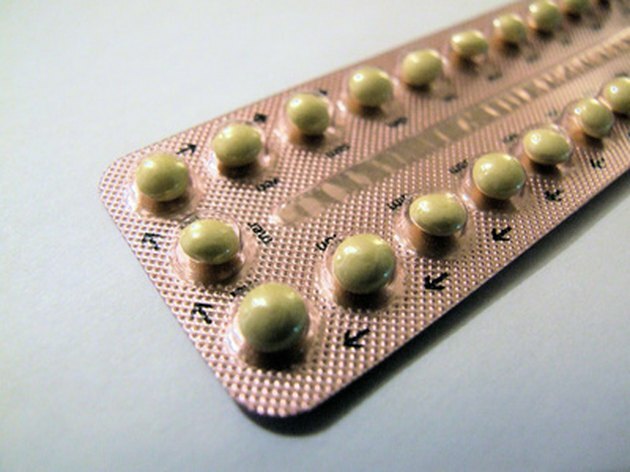 The progestin-only pill does not contain estrogen. To prevent pregnancy, it relies more heavily on changes to your cervical mucus and endometrium lining. You may not stop ovulating with the mini-pill. By maintaining a high level of progesterone in your body, you inhibit the secretion of two hormones, follicle stimulating hormone and luteinizing hormone. This results in no new egg follicles being developed. The mini-pill may be slightly less effective at preventing pregnancy. But the mini-pill may also have fewer side effects. Unlike the combination pill, you take the mini-pill every day without any breaks. Your periods can stop altogether if you take the progestin-only pill or they can become irregular. Progestin-only pills are generally prescribed to nursing mothers because estrogen can interfere with their milk supply. Women with high-blood pressure, blood-clotting problems or sickle cell disease may also be prescribed the mini-pill instead of the combination pill. In addition, women who are 35 and older, smoke or otherwise should not use estrogen may be given this type of pill. Both types of pills provide important health benefits, some of which are not related to contraception or menstruation. For example, they decrease your risk of ovarian and endometrial cancer. In addition, your periods may become lighter; less blood loss means less risk of anemia. Some women may also be prescribed these pills to alleviate the pain associated with menstruation, and to mitigate when they have unusually heavy menstrual flow. Your doctor may prescribe either type of pill to treat conditions not related to contraception or menstruation. This is called "off label" use, and as of 2011 the pills are approved by the U.S. Food and Drug Administration for these additional uses. For example, they may treat acne, polycystic ovarian syndrome, endometriosis, perimenopause and hirsutism, a condition involving growth of facial hair.